ZUS is a dual-purpose gadget, both a car charger and car finder. If you feel like you already have too many gadgets, you’ll appreciate one that’s beautifully designed and serves more than one useful function. Even if you have no need or interest in a car finder, this is the best rapid car charger I’ve ever had. It has two USB ports that can support devices for both a driver and passenger. Designed in Germany, it is small, unobtrusive and angled so that it doesn’t get in anyone’s way. It fits snuggly into the car’s cigarette lighter and works for both iPhone and Android devices. When the motor is on, both sides of the charger are lit so you don’t have to fumble to plug in your phones or tablets. The best part, however, is the awesome speed of the charge. Last Saturday night, I was almost to the door, about to leave home, when I remembered I didn’t have my cell phone. I located it (using my land line to call the cell), looked at the battery meter and realized it was almost dead. Sound familiar? This wasn’t the first time this has happened me. I hate to admit it but I was worried that I wouldn’t be able to use my phone to take photos of my dinner. As soon as I got into the car, I plugged my phone into my new ZUS charger. By the time we arrived at the restaurant, the phone was fully charged. If I had used my previous car charger, I would have reached my destination with insufficient battery power to use my phone for photos. Although the incident occurred long ago, I’ll never forget the time I parked my car at Shea Stadium to attend a Mets game. When my friend and I left the stadium after the game ended, we realized we had neglected to notice where we had parked our car. The stadium held tens of thousands of people so you can imagine how long we had to wait until the parking lot emptied out. It was after midnight when we finally found the vehicle in the vast lot. This saga took place in the old days—before GPS devices were built into every smartphone. I haven’t had a chance to try out the car finder yet. The problem may be that someone who can’t remember where she parked may not remember to make sure the app is running when she leaves the car. On the other hand, I don’t think I’m likely to make the same mistake again at a sports arena and this locater may be just what I need. The Zus car charger and car finder is available from the manufacturer or on Amazon, priced at $29.99. It’s beautifully packaged in a Apple-type minimalist box so it makes a nice gift for a friend or relative. 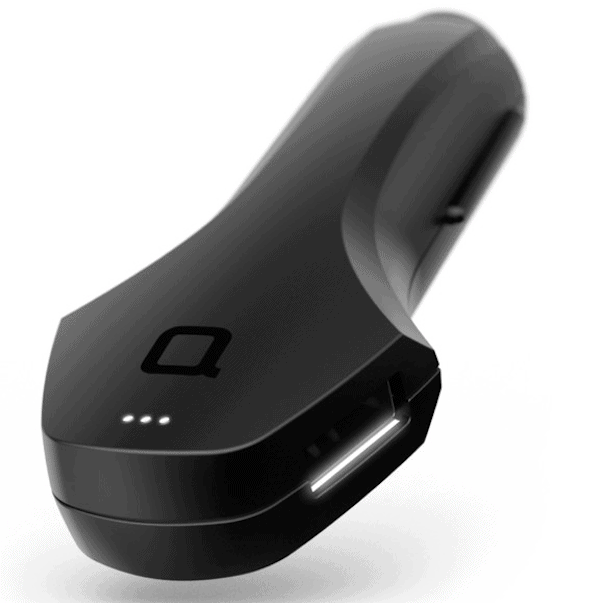 Read additional information about the ZUS car charger and car finder. Disclosure: This ZUS charger was sent to us for review by the manufacturer but any opinions expressed in this post are our own. For someone who is ALWAYS searching for my car, this device is a must-have! Planning a trip to Sweden? Call "The Swedish Number"